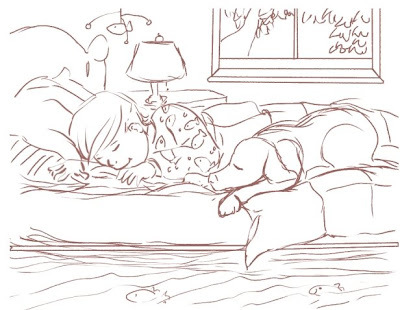 I find it very hard to sketch with just a line, so most of my sketches are a bunch of lines and sometimes gray tones. 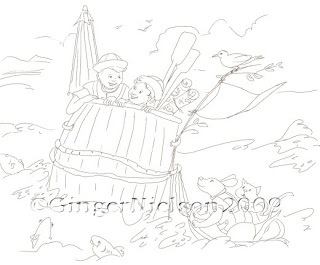 Once I have the basics set then I can refine the sketch for painting. The freedom of being able to just let the sketch HAPPEN is very important to me. 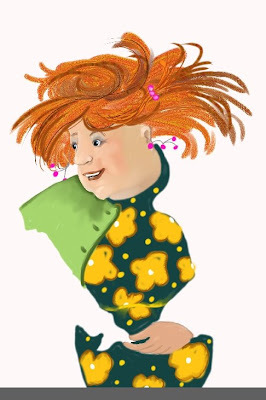 This is another sketch of Aunt Tallulah. I love her style and the flowing capes and caftans she favors. It allows me to use a lot of color when I include her in a scene. What I am working on now is so much fun! My own story that will soon become a finished dummy and then who knows. 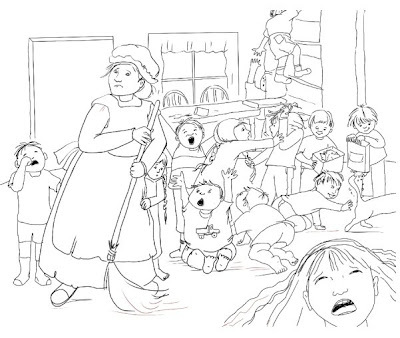 Here is a sneak peek at Aunt Tallulah. Her sketch is done and I have only started the painting in Painter X. I have some time now so I am really enjoying every stroke I paint. Tallulah is an interesting character to work with. 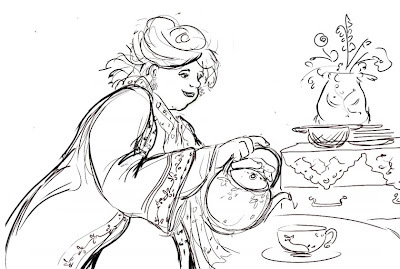 She is hospitable, generous, colorful and loves loves loves to bake goodies and serve tea. In fact I would love to go to her house today. Maybe the sun is shining wherever she is! And Yes, she is based on a real life character I knew and loved as a child. Her sister is just as colorful and interesting as she is, and there will be a sneak preview of Beulah in weeks to come. Labels: dummy, Ginger Nielson, sneak peek, Tallulah, tea. This is a small version of the current dummy I am working on. And speaking of bears waking up... we had to take down all the bird feeders. We sometimes forget to take them in at night, and that is when the bears seem to find the most opportune time to have a birdseed buffet. It never ends with just a snack for them, they totally destroy any container and even bend heavy metal poles just to get to the food. Fortunately for the hungry birds, the forest is full of plants and seeds that the birds eat and now a HUGE new crop of mosquitoes. 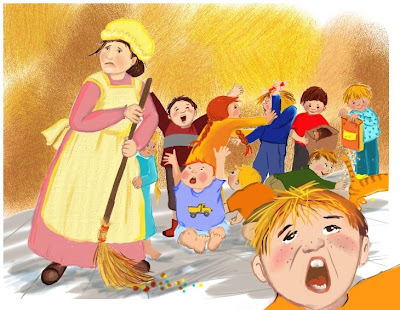 I had been working on this illustration last week, and this week added a character. 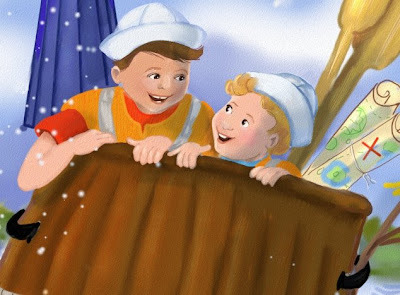 It is always fun to have friends join you on an adventure. Oh, yeah, Little Red Riding Hood and the lurker behind her have been done and done and redone, but I wanted to paint a nice red coat.... and who better to wear it for me than Little Red herself. Drifting off to dreams after a day of fishing with dad. I have a very good and generous friend who showed me how to expand my blog to allow for larger images. This is an experiment to see what my final settings will be. I like the extra space and am grateful for friends who are willing to share their ideas. 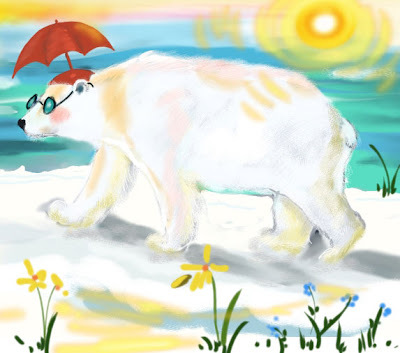 Since I already posted my Illustration Friday piece for this week's theme, this is just a test to see how my blog will look with larger images and more space. I posted this earlier in the week as one of the revisions of an older illustration. 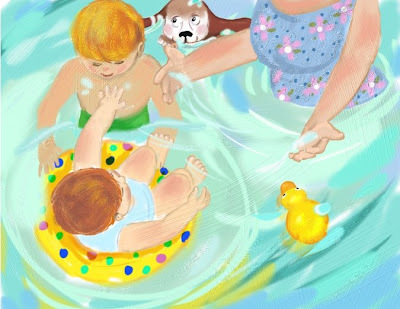 Since I did the work this week, I am hoping it is okay to post it for Illustration Friday's theme of "Drifting ~ "
Everybody wants to get into the pool! 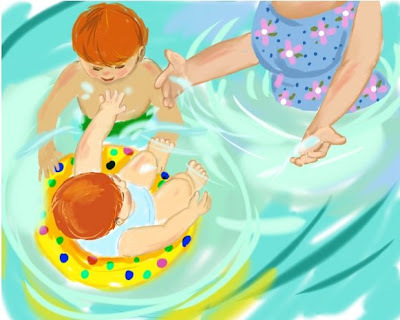 It is important to have safe swimming practices, buddies, parents, or grandparents with young children at all times near the water. Lots of us like to jump right in before we check things, out, so be safe this summer. Check the depth of the pool before you jump in, or find out what is on the bottom of a lake before you venture in. 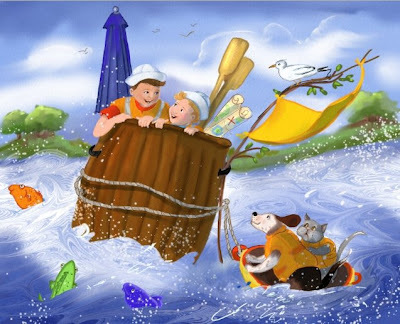 Wear your life preservers when you are boating or kayaking and never swim alone. 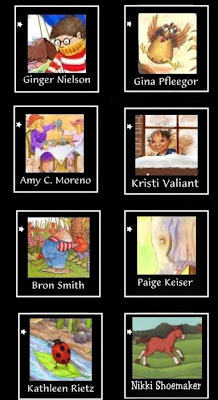 The Picture Bookies is a group of 8 professional author/illustrators who spend their time creating stories and illustrations for children. Hop on over to their blog and take a look at what they have been doing and are preparing to do. This is the newest version of an old version of an older version. I am happy with this outcome. 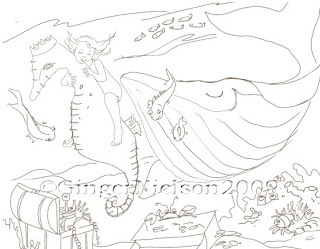 I had always wanted to find a place for this whale in the undersea picture. 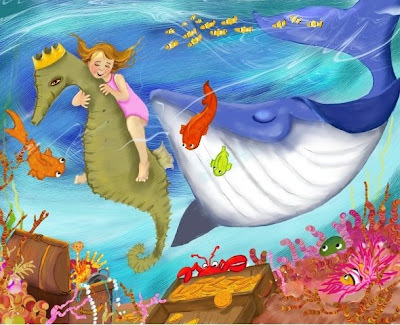 Since it is all the way under the waves you will just have to imagine that little girls in pink bathing suits have a magical ability to breathe under water, but only when riding oversized seahorses. to the foreground and give more impact to his mission. The tree was like a ladder to the sky. 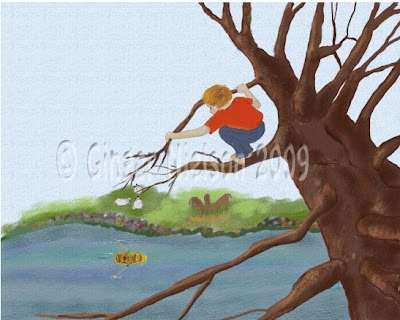 Owen climbed until he could clearly see the length of the river below. 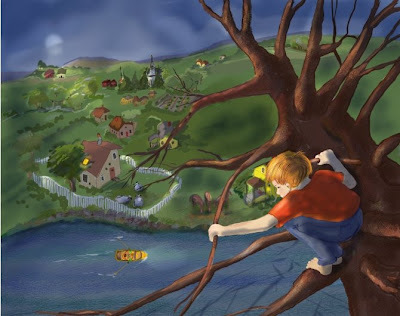 From this point, high in the tree he spotted the rowboat. As it passed beneath him he knew he had only moments to sound the alarm. I have begun painting the first of the three sketches I posted eariler. I am beginning to get the direction I want for the first of the three sketches I planned to paint this week. From the way I am progressing, however, it may take a bit longer. Somehow I don't always seem to satisfy myself with the first few color studies. That means either going back to change things or starting from scratch. This is always a learning process, but a wonderful experience. 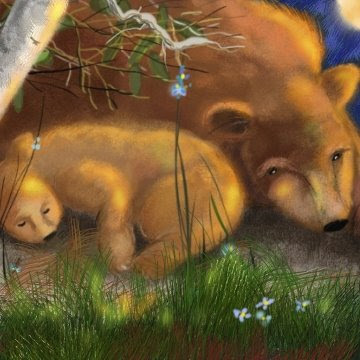 What I am working on this week, in addition to cleaning up in the studio, is revising and repainting some older sketches. In my cleaning and culling process I often find sketches that I have previously scanned and painted...often in too much of a hurry. As the events of the day began to UNFOLD, Mrs. McInnes realized her dreams of becoming a brain surgeon were limited. Of course, had she chosen to be a rocket scientist instead, she might have more options where immediate travel plans were involved. I made this Illo Friday theme stretch a bit, since I had been working on it all week. The earlier sketches were posted a few days ago. The piece began to grow and may yet still evolve. I had such fun doing this one. I really got to KNOW each child and feel like they belong to me as much as they belong to Mrs. McInnes. If I were to pick the one most like me... it would be the girl with her boot propped up against the door frame. .... and then, the doorbell rang! "Oh wait!.... One of them is missing. Is that him ringing the doorbell again? But take heart... it could be worse! 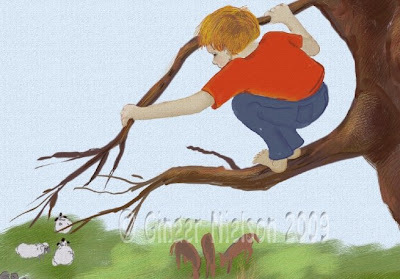 This is an illustration from a story I am developing. I wanted to show more texture in the pieces and especially in the sheep. 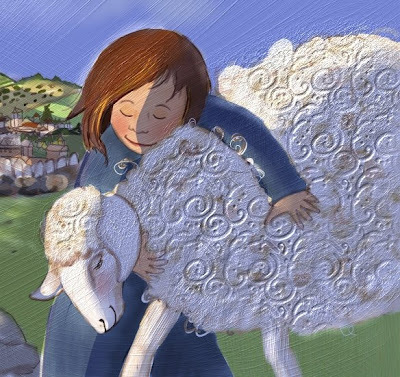 So, here I embossed a pattern over the sheep's wooly coat. Using Painter X, I created the pattern first, one that I liked, saved it, and then used it with the pattern embossing brush to create the effect. Using a technique like this once in a while can be effective. One just has to be sure not to overdo it. 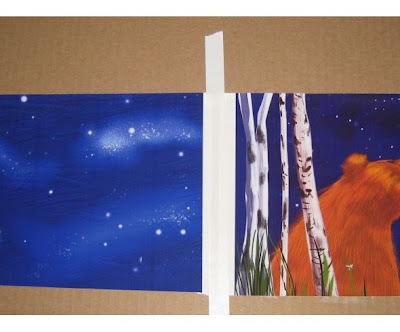 I am hoping to find some other ways to create various textures that won't overpower the other spreads in this book. I love the journey that illustration takes me on each day! And it is now on Amazon.com as well. 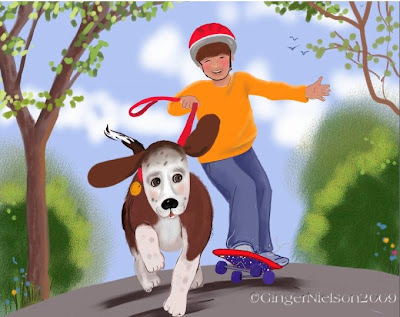 The book I illustrated written by Barbara B Slater through the design director, Carol Pentleton, at the Digital Artist is finally OUT! 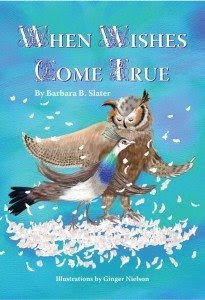 "When Wishes Come True" is a wonderful story of love and friendship between two creatures that wished for something different in their lives. When they find each other, a beautiful story unfolds that will capture your heart, and make you laugh and cry .... sometimes all at once. The reviews are worth reading as is Barbara's bio which details her many talents and gives one insight into her generous soul. As happy as I was with the reviews, I was even happier to have been a part of this beautiful gem of a story. "Make a Wish...It Could Come True. When Penelope PeaHen and Oliver Owl decide they want to improve their lives, they each make a wish. Unlike most of us, however, they both do something about making their wishes come true. 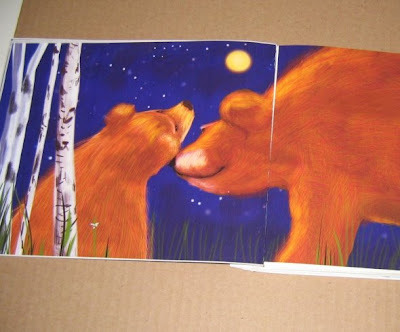 This is the story about how two most unlikely special friends found each other, and themselves." Shamwari means friend in Africa. This morning I received a beautiful photo from a "friend" in South Africa. 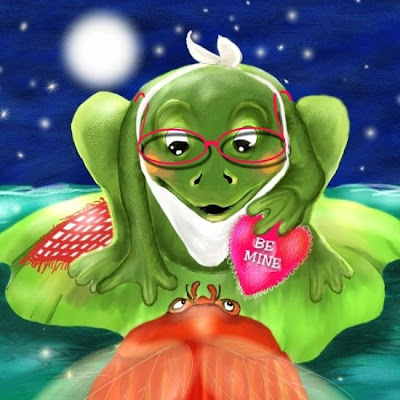 Brettell Hone is the author of the book I illustrated that is out now. "My African Bedtime Rhymes" and he is also a great humanitarian. 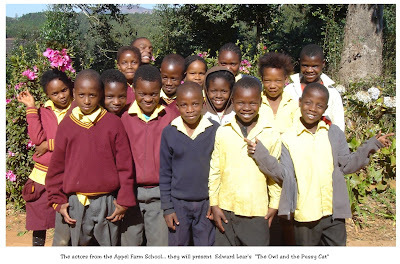 One of his recent projects involved working with the children of the Appel Farm school in his region presenting a play. 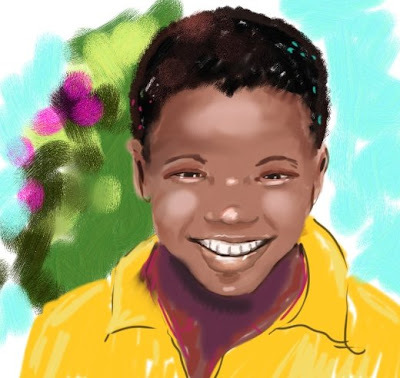 From the photo I chose a composite of several children to create "Shamwari." 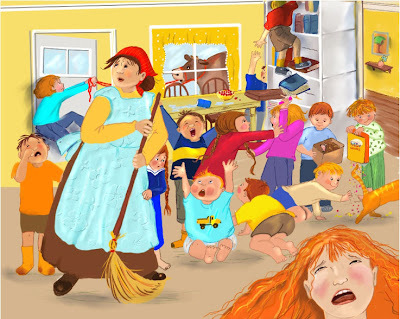 I had such fun doing this, because the children are so full of delight and energy. Brettell says they have "radioactive" energy and I can just imagine as a former teacher what it takes to corral that energy into positive action. I am so happy to have been involved in Brettell's book and look forward to hearing more about the children from the Appel School. 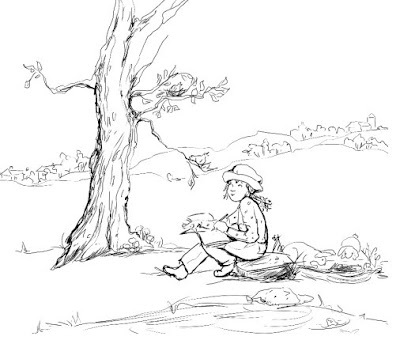 They are rehearsing Edward Lear's "The Owl and the Pussycat" to get into the mode of learning to recite rhymes. Later they will move on to more difficult works. Another image of skating. Earlier image can be viewed below. What I want to do is combine these two and maybe another into one larger piece. The hard part is not the putting together, there are so many variations. 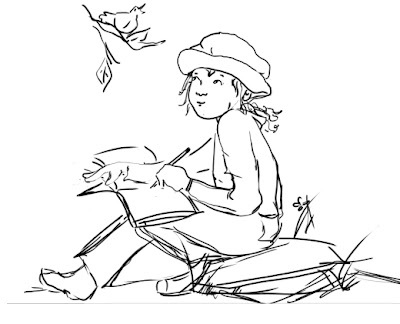 The HARD part is thinking through the illustrations, creating a storyboard and actually getting all the sketches done. I like to use an adhesive strip type glue, white artists tape and presentation paper that allows you to print on both sides. So, assuming all that is done and you have the requisite 32 pages with front and back cover, you need your pages and your tools and a space to work. Using good presentation paper that allows you to print on both sides of the paper is a plus. It saves paper and makes a lighter product overall. 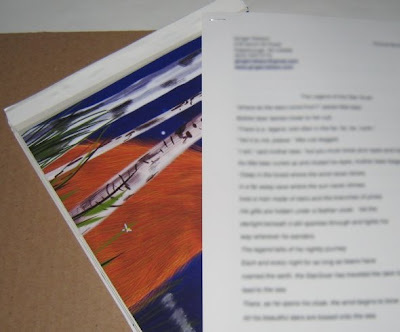 When I put a dummy together for a publisher or editor, I use only printed reproductions of the artwork. I usually print them onto a paper that allows for at least one half inch of white space at the spine edge. 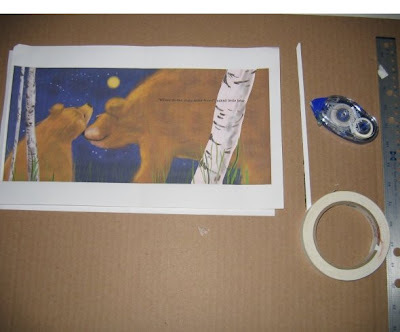 That area is for gluing and then taping the finished papers together. Once I have the sketches and several finished paintings printed out I use an adhesive glue dispenser to join the back edge of each page to the next. When all the pages and the cover are glued at the spine side in this way, I enclose the entire spine with Art Tape to hold the booklet together. 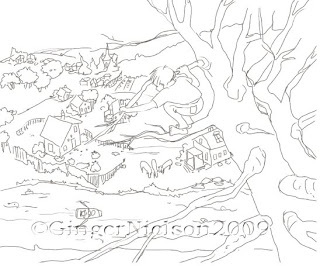 A 32 page picture book dummy will consist of two signatures, or sections of 16 pages each. In the dummy that translates to two sets of eight sheets of paper printed on both sides and joined to each other. Since I am glueing the pages to each other at the spine and then taping over that extra edge I won't be stitching the dummy together. Next I make a cover. The cover is simple for a dummy that I plan to mail. 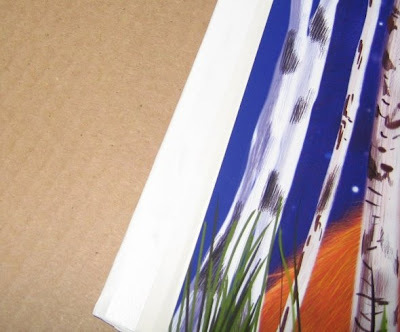 I use bristol board as a backing and glue the cover images to a front and back cover piece. I lay the two of these flat and leave about a 1/4 inch space between the two covers and run a strip of tape down the empty space. Then I turn it over and lay the finished dummy right on the tape. Closing the book and leaving it closed for about an hour usually insures that the cover will stay put. I can always add some white glue if it doesn't want to hold. I will always print out one or two finished illustrations on good presentation paper that are separate from the book. 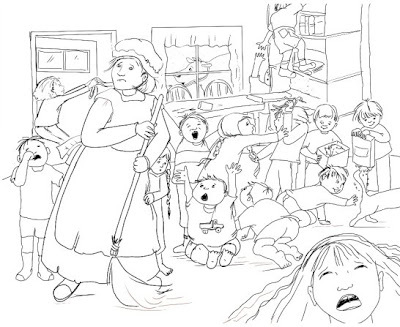 Hopefully if the book is enjoyed the editors will have these loose images to pass around. You need to be sure all of these are labeled on the back. prepare the accompanying manuscript and I am ready to present the finished work to a publisher for consideration.